James Corden‘s first “Late Late Show” received a 1.4 rating/5 share per overnight Nielsen numbers, which count the 56 metered markets. That rating is up 27 percent versus the same night last year (1.1/4), and up 17 percent over “The Late Late Show’s” season average. As expected, that number is down from former host Craig Ferguson‘s debut many years ago, when TV viewing habits were different. On Jan. 3, 2005, that version of the post-Letterman timeslot earned a 1.8/7. Corden’s kick-off also couldn’t compete with Seth Meyers‘ big year-ago debut on NBC in the same timeslot, a 2.6/9, which was boosted by the network’s Winter Olympics coverage. The “Into the Woods” star’s initial number bested “Late Night” last night, however — that show got a 1.2/4. 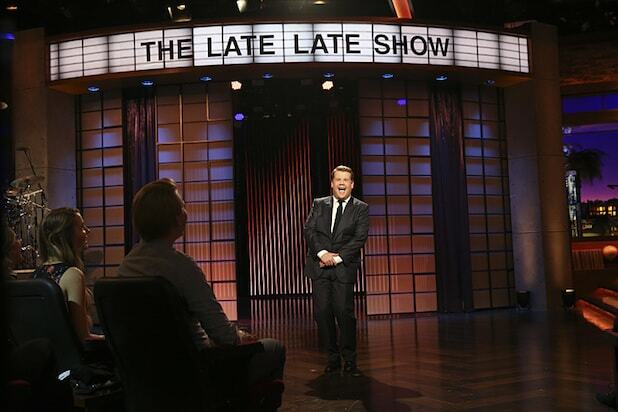 Corden matched ABC’s “Nightline” on Monday, a shorter show with less time to include in the average. The earlier late-night offerings — “The Late Show,” “The Tonight Show” and “Jimmy Kimmel Live!” — all easily scored better marks in their more desirable timeslot last night.